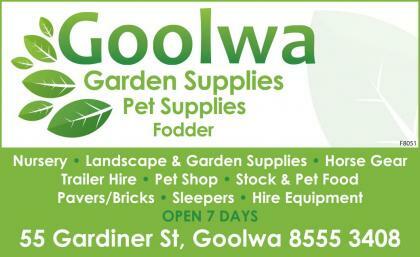 Goolwa Garden Supplies is the place to go for all your landscape and garden supplies, pet and stock food, pavers and bricks, sleepers and even hire equipment including trailers and tools for the home handyman or subcontractor. The business also includes Bart’s Pet Corner offering everything you need for your pets and even sells birds and fish. Glen Meer Equine "Glen Meer"